Lamp offering symbolizes the light of wisdom dispelling the darkness of ignorance, in order to attain Buddha's luminous clear wisdom. It is also a skilful method to encourage harmony and generate merit while promoting success, prosperity, longevity, peace and love, as well as helping to avert obstacles, pacify the upheaval of the five elements and heal diseases. The enlightened ones do not require the offering of light, this is a means for us to dispel the darkness of our own ignorance and to clear our obscurations and defilements. A lamp offering also carries the wish to attain buddhahood and the aspiration to recognize the clear light at the time of death, thereby experiencing liberation in that moment. In this way lamp offerings are associated with transitions in one's life. 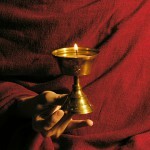 Lamp offerings are best made before consecrated representations of fully awakened wisdom, loving-kindness, and compassion. 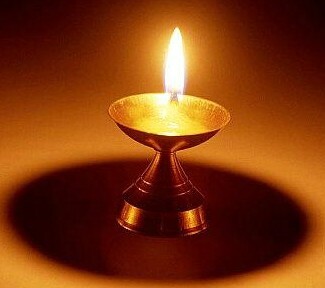 Because of the association with great good fortune,lamp offerings are made for any individual or family life event that is celebrated, such as the birth of a child, the marriage of a couple, the graduation of a son or daughter, the birthday of a friend, and the anniversary of one's parents.